Whether you are an experienced teacher moving to Georgia from another state, a fresh college graduate excited to start your teaching career, or a seasoned professional looking to make a career change, anyone interested in taking their talents to the classroom has to pass the Georgia Assessment for the Certification of Educators or GACE test. As a teacher, you are also a learner, and you definitely want to provide yourself with the best GACE study guide to make practicing for the exam efficient and effective. Unfortunately, the test prep industry has not taken the same care and attention to detail that you will in your future classrooms. Their interests lie in pumping out a high volume of material and writing misleading product descriptions that promise their practice tests will help you pass the test on the first try. What they don’t tell you is their GACE practice test questions and content do not match those on the GACE exams, and often times users like you had to double check the answer key because of spelling mistakes, typos, and incorrect answers! To make matters worse, there are practice tests out there that publish incorrect questions and answers on the GACE tests. Finally, these expensive practice tests are often riddled with spelling mistakes, typos, and read as if the publishers skipped the editing stage. Your time and money is too valuable to be wasted on useless practice tests and questions that do not match the actual test. In this article, we discuss three of the biggest complaints from actual users of GACE practice tests and give you practical tips for how to navigate them so you can use GACE practice tests effectively. The following GACE exam cheat-sheets provide step-by-step test prep advice that helps you pass the Georgia Assessments for the Certification of Educators faster and easier. Problem #1: Practice test questions do not match the real GACE test. Can you imagine working hard day after day to prepare for your GACE exam only to find that the questions on the test were completely new and different from those you had practiced? It would feel like a total waste of your time and money. People who become teachers are generally kind, honest, and trustworthy humans who want to help others, so when they buy a set of practice tests they trust that it will do what it says and prepare them for the GACE exam. However, test prep companies publish texts that do not help users pass the GACE. They include practice tests that have wording that does not match the real test making them basically useless. So what can you do to find the best resources to practice for the GACE? The best solution for test takers to find accurate practice tests is to triangulate sources. Triangulating sources is a fancy way of saying compare multiple resources. Test takers should review free practice test problems from the official GACE study companion and compare the wording and style to any practice tests they take or are considering buying. Free online resources such as quizlet provide practice test questions written by previous test takers who were once in your shoes and want to help you be successful. Don’t waste your money buying the first practice test resource you see on Amazon. Instead, try multiple sources such a free online quizzes prepared by teachers for teachers and free practice tests from the GACE website, and compare those with any practice test materials you purchase. By triangulating your resources, you can be confident that when you show up to the test, you will be prepared for the range of possible questions. Problem #2: Questions often don’t match the correct answers. Many teachers like you, eager to pass the GACE exam turn to practice test materials to prepare for their big day. Since the GACE test is a significant financial investment, it makes sense to want to buy the best practice test materials on the market. Unfortunately, in this case you don’t get what you pay for. Too many test takers reported their practice test guides were riddled with questions and answers that did not match. Some do not include an explanation for each answer leaving those who have trouble without any direction or clarification. Sadly, reviewers also noted that the practice tests sometimes published incorrect explanations and questions that could not be answered causing frustration and extra time spent double checking. So if you can’t rely on the answer key in pricey practice tests to give you the correct explanation where can you turn? New technologies such as www.wolframalpha.com, a computational intelligence platform allow users like you to ask a question and receive solutions that include step-by-step details. You can register as a free user and ask a range of questions from math to art and from physics to history. Leveraging technology is another way to triangulate questions and answers so that you have confidence that what you are learning will help you pass the GACE exam. Test out the process by checking the answer to a question you already know, so that you can become familiar with the style of the output. Problem #3: Frequent spelling mistakes, typos, and bad organization. How can you trust a practice test that has a lot of mistakes in the book? What if every other paragraph had a typo and some sections seemed like they were cut and pasted into the wrong place? How confident would you feel after using these materials to study? Some practice tests for purchase on Amazon are riddled with so many errors that it seems like the publisher skipped the editing process completely. Your time and money is too valuable to be wasted on a product with sloppy organization and careless inconsistencies. You deserve better. Thankfully, there are a number of free or inexpensive resources such as those from the official GACE website that produce practice tests. You can use these test questions to identify the objectives that will be tested. Then, as a way to deepen your understanding of the material and flex your future teacher test-making muscles, you can try your hand at crafting your own multiple choice questions. You can tailor the questions to the objectives found on the official GACE website for free and create your own practice test. Building test questions requires the use of higher order thinking skills, which will benefit you on exam day. Choose an objective on the GACE exam. Outline the core content that relates to that objective. Rank order the key points. Use the official GACE practice test to mimic a series of question stems. Develop responses, including distractors (incorrect options) using clear, grammatical language. Make sure the responses are similar in length and format. When building the distractor responses, include common misconceptions and believable material that relates to the question stem and avoid silly, meaningless fluff. You will find that in the time it takes to craft a good multiple choice question, you will have covered a huge amount of content aligned to the GACE test objective. As an added bonus, you can post your questions to a website like quizlet.com to help future teachers reach their dream of leading a classroom full of students. Finally, websites such as Studygs.net offer additional support in crafting useful multiple choice questions. 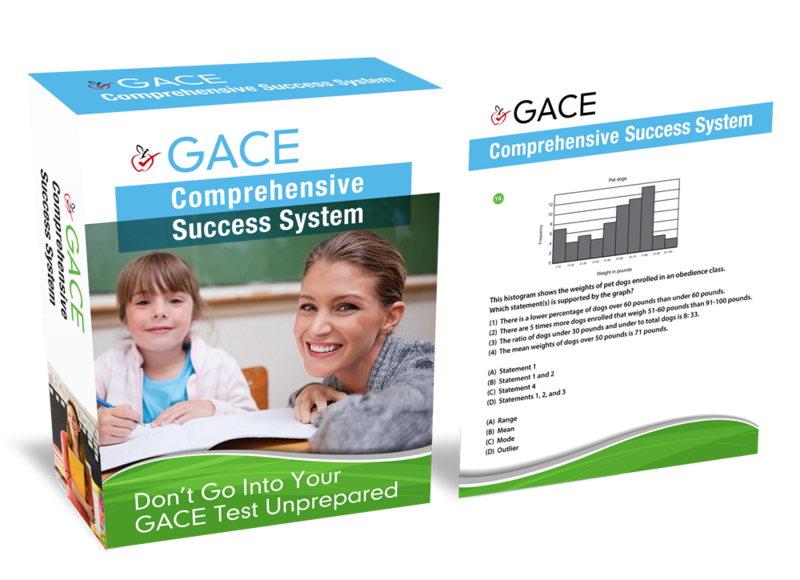 You will feel empowered in your test preparation by beginning with the official GACE practice test materials rather than relying on non-official ones. Then, once you learn more about the specific objectives you need to study, you can begin to triangulate resources such as practice test apps, practice test books, and free online websites to find those that will help you become a certified teacher. Finally, remember to use new technologies such as www.wolframalpha.com to get extra, step-by-step insights into how to solve the problems you need the most help with.